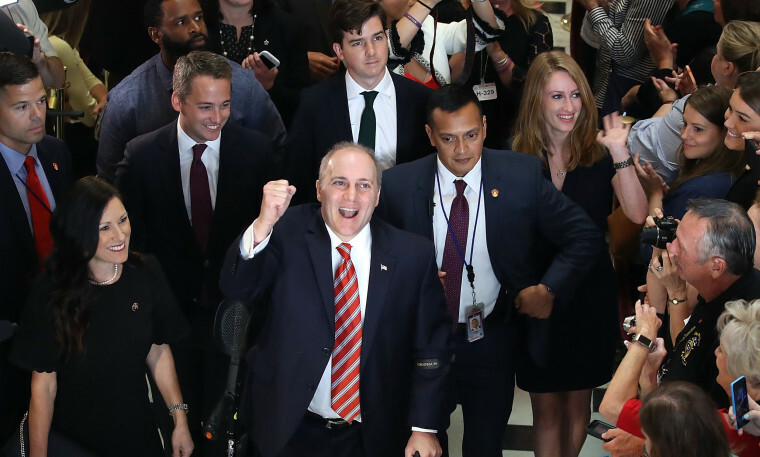 WASHINGTON — Rep. Steve Scalise, gravely wounded when a gunman opened fire on a congressional baseball practice three months ago, returned to the House on Thursday for the first time since the shooting, earning an emotional standing ovation from his colleagues. “You have no idea how great this feels to be back at work at the 'People’s House,'” he said to several rounds of enthusiastic applause. “As you can imagine, these last three-and-a-half months have been pretty challenging,” he said. “But if you look at the outpouring of love, of warmth, of prayer, my gosh, Jennifer and I have been overwhelmed,” he added, referring to his wife. Scalise, from Louisiana and the third-ranking Republican in the House, was shot June 14 when a gunman opened fire on the party's congressional baseball team as they were practicing in Virginia. On Thursday, he thanked his colleagues, the U.S. Capitol Police, the security detail he had the day of the shooting — and God. “Our prayers have been answered,” Ryan said. President Donald Trump also weighed in, calling Scalise a "special man" and "brave," adding that he was "so excited" the congressman was back. "What happened to him is horrible," he told NBC News. "We are so happy." Scalise, 51, was standing at second base when the shooting occurred, witnesses said. He was hit in the left hip but managed to drag himself into the outfield and was rushed across the Potomac River to a Washington hospital. He sustained injuries to his internal organs and required several operations. “They put me back together again,” he said, laughing.